Guests examine the new V-class van at a presentation in Munich. The V class will be offered with options usually only seen in premium Mercedes cars. 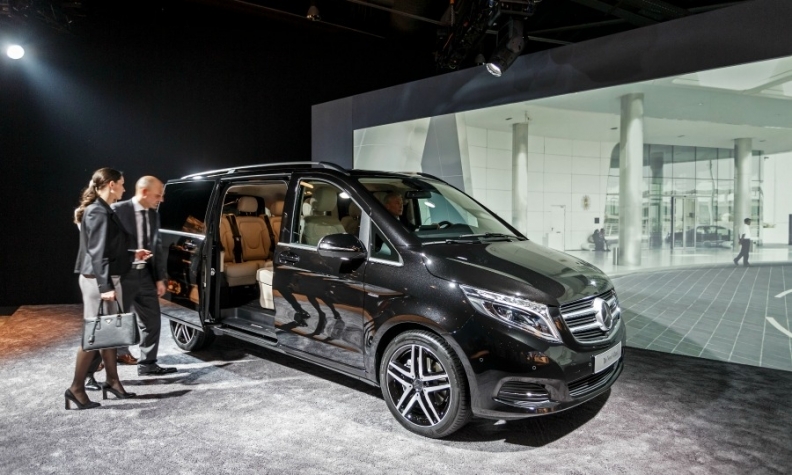 MUNICH (Bloomberg) -- Daimler is bringing back the Mercedes-Benz V-class van with features from the flagship S-class sedan to support a plan to raise deliveries almost 60 percent. Daimler, also the world's biggest truckmaker, set a target in 2012 of selling 400,000 commercial and passenger vans annually by next year. The V-class, unveiled at an event in Munich on Thursday, will be offered with options usually only available on premium Mercedes cars, such as radar detectors and cameras to observe surroundings, a parking-assist system and a smartphone-like touchpad for radio and navigation controls. Pushing the vehicles upscale is "absolutely necessary," said Juergen Pieper, a Frankfurt-based analyst at Bankhaus Metzler. "Up to now the vans had a quality level that couldn't compete" with models from Volkswagen Group. "Mercedes is aiming to catch up with the competition as fast as possible. That's their first priority." CEO Dieter Zetsche has laid out a goal for the luxury Mercedes brand to surpass larger competitors BMW and Audi in global deliveries by 2020, and the division's sales growth last year beat gains at competitors. Daimler is reviving the V-class name for passenger vans to help attract customers by matching the naming system it uses for premium Mercedes models such as the A-class compact and up-market E-class sedan. The V class "will significantly expand our large and demanding fan club," and "it absolutely deserves its place in the Mercedes alphabet," Zetsche said. The new vehicle, which will replace the Viano, will seat as many as eight people and is aimed at families, shuttle services and people who want to transport bulky sports gear. The V class also features LED headlamps and high-end stereo speakers similar to those in the S class, the company said. "The model combines the best of two worlds," with "the functionality of a traditional van and the typical strengths of a Mercedes-Benz passenger car," Volker Mornhinweg, head of the van division, said at the presentation. ''We are addressing completely new customer groups — including people who need a large amount of space but never wanted to drive an MPV because style, well-being, and riding comfort have so far been neglected in this segment,” Mornhinweg said in a seperate statement. The V class is priced at 42,900 euros ($58,400), and joins a line-up that includes the similarly sized Vito and larger Sprinter commercial vans and the Citan delivery vehicle that's based on French partner Renault's Kangoo. The V-class name was in use from 1996 until 2003, when the Viano was introduced, according to Sebastian Michel, a spokesman at the unit. Daimler's van division has broadened its production base to Russia and China in the past few years, and it has a target of increasing the profit margin to 9 percent of sales from 6.7 percent in the third quarter 2013. The business generates about 8 percent of Daimler's revenue. Production of an updated Sprinter model started in July in the German cities of Duesseldorf and Ludwigsfelde. A new version of the Vito will come to market later this year. The Viano is still built at a joint venture factory in Fuzhou, China, where Daimler is setting up its first van development center outside Germany. Daimler will gain capacity when its Sprinter assembly lines stop making Volkswagen's Crafter model as a contract expires in 2016. The company is spending about 190 million euros to renew the paint shop and assembly lines at its van plant in Vitoria, Spain, for the V class. The site employs about 3,100 people. Daimler was targeting an increase in van sales last year from the 252,400 delivered in 2012, and it forecast growth in the business's earnings before interest and taxes to 600 million euros from 541 million euros. The German company is scheduled to publish full-year earnings figures on Feb. 6.